This is another delicious, fast chicken recipe. It can be done ahead of time but it really only takes about 5 minutes to prep for it and another 15 minutes to cook it. See my notes below. Trim any excess fat and remove the skin if the breast came with it and remove the small filet from the bottom of the breast if it came still attached to them. You will fry these separately. Dry the breasts off with a bit of paper towel. Take the 2 egg whites and salt and beat them together lightly just enough to break up the egg white. 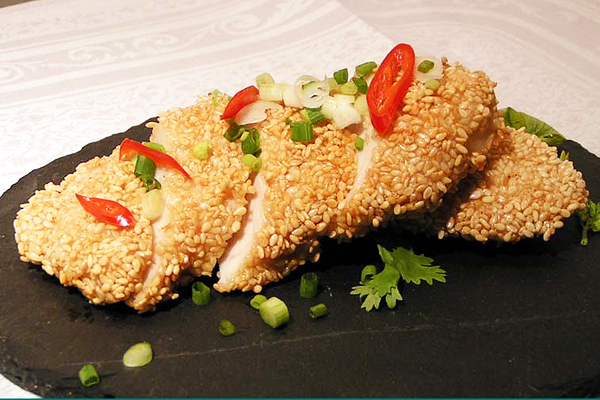 Dip each chicken breast into the egg and then into a bowl containing the sesame seeds. Shake the bowl to be sure they are well covered. Place the chicken breasts on a plate or tray lined with paper towel in a single layer. You can prepare them up to this point and then store them covered in the fridge until you are ready to fry them. In a large deep frying pan heat the oil until it is hot but not smoking. It should be deep enough to be 2½ cm deep or 1 inch. Fry them for about 5 minutes on one side turn them and fry again for another 4 or minutes. This will depend on how thick the breasts are, small filets will take only 5 minutes maximum on each side. Remove from the pan and drain onto kitchen towel. Serve immediately with Chinese Chili Sauce, Plum Sauce or make up a dipping sauce of your own with a little Hoi Sin (Chinese Barbeque sauce). This will go particularly well with the Chinese/Thai Sesame Noodles or perhaps some stir-fried Bok Choy with a little ginger, garlic and soya and a cup of rice on the side. Or simply with a simple salad. This is a great dish for one person as you can have everything you need for the sauces in the refrigerator which is the hard part. Almost everyone I know has a bottle of Chinese or Thai Sweet Chili Sauce in the back of the fridge! About frying, sesame seeds like to pop when put into hot oil. I suggest a screen to place over the frying pan to save a bit of clean up, and that you are not inadvertently frightened out of your wits if and when the sesame seeds begin their little drama in your frying pan. 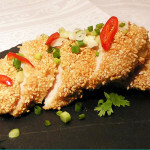 You can also cut up chicken breast into something like McNuggets, coat them with sesame seeds and serve them as a cocktail snack with drinks and a little bowl of dipping sauce.